A profound sense of loss is felt at the death of a loved one, whether that death is sudden or expected. There is no set pattern to grief. Some people grieve for a short time, while others may never fully recover from their loss. Some won't experience their grief until sometime later. There is no one right way to grieve: as each of us is unique, so too is our grief. It is during these times that the support of friends and family is so important. Having a visitation, funeral or memorial service is an important part of the grieving process and brings people together who can give you a support network. If that is not enough, your local community, religious organizations and many healthcare organizations offer grief counseling or grief support groups. Although it may be difficult to reach out to these groups at first, many have found grief support groups to be a place where one can continue to grieve openly with others who share their pain. Below are some resources that we hope will be helpful for those dealing with grief. Our caring tradition for families does not end with the service. Attention to detail continues with follow-up calls, document processing and other family concerns. Each year, we hold a Holiday Remembrance Service to honor those individuals we have serviced in the past year. All are welcome to attend. Our Lunch & Learn series is a free, community education program featuring a variety of topics and speakers, including grief support. Workshops are approximately one hour and lunch is provided afterwards. Please visit our News & Events page for more information and upcoming events. Also available is our 365 Days of Grief where you can receive consistent support through our daily email affirmation to help you cope, heal and properly grieve during this difficult time. No matter when your grief arrives, you will receive the help and you will always have a message of hope and inspiration to help you through your most difficult times. GriefShare is a friendly, caring group of people who will walk alongside you through one of life’s most difficult experiences. You don’t have to go through the grieving process alone. GriefShare seminars and support groups are led by people who understand what you are going through and want to help. You’ll gain access to valuable GriefShare resources to help you recover from your loss and look forward to rebuilding your life. There are thousands of GriefShare grief recovery support groups meeting throughout the United States, Canada and in more than ten other countries. There’s one meeting near you. The internet's first interactive grief website that has served the bereaved on the internet since 1995. It offers grief discussion boards where men and women can discuss issues related to grief and healing or browse recommended grief books. The site's originator, Tom Golden of Washington D.C., is an internationally known psychotherapist, author and speaker on the topic of healing from loss. Whether your family has had a child die (at any age, from any cause) or you are trying to help those who have gone through this life altering experience, The Compassionate Friends exists to provide friendship, understanding and hope to those going through the natural grieving process. Through a network of more than 625 chapters with locations in all 50 states, as well as Washington D.C. and Puerto Rico, The Compassionate Friends has been supporting bereaved families after the death of a child for four decades. For more than 50 years, AARP has been serving its members and society and creating positive social change. AARP’s mission is to enhance the quality of life for all as we age, leading positive social change and delivering value to members through information, advocacy and service. 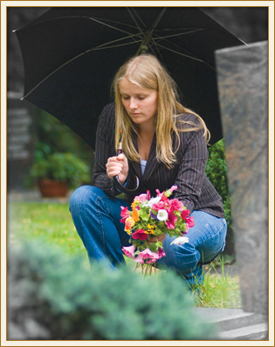 It offers articles, discussions and helpful information on dealing with grief and loss. Below are links to additional online grief and resource websites.